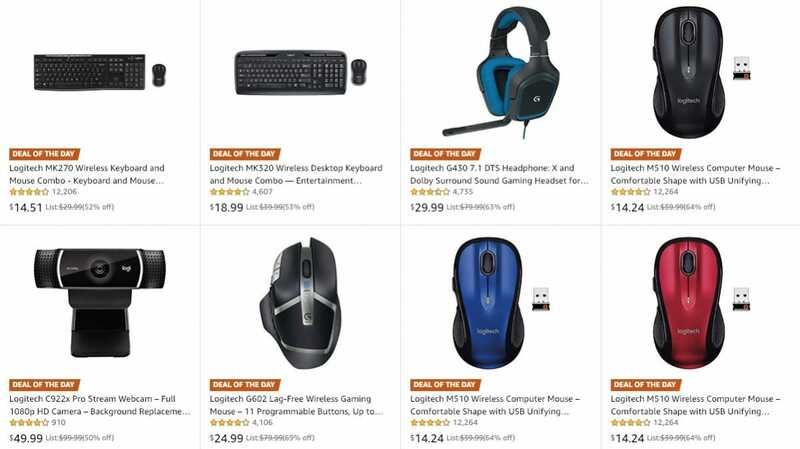 If you’ve been in the market for a new keyboard, mouse, headset, webcam, or speakers, today’s Amazon sale on a handful of Logitech products has you covered. Granted, this isn’t the first time that a bunch of Logitech stuff has been discounted on Amazon, nor is it the largest Logitech sale we’ve seen, but it’s never a bad time to buy when you can get a good chunk knocked off the price of that one gaming mouse you’ve had your eye on for a while. Case in point, you can grab the Logitech G602 wireless gaming mouse for just $25, which is a steal considering the product that you’re getting. Furthermore, if you need a cheap gaming headset, the G430 is just $30 right now. And if you need a basic wireless keyboard and mouse to just get you by, the MK270 combo is just a bit shy of $15. Make your decisions quickly, though, since this deal will only be around today. Hit the button below to see all the goodies on sale today—some of it is going for up to 70 percent off, so it’s worth a peek.